Anyone who has ever traveled with kids knows how hard it can get. I love kids. But let’s be honest for a second: they can be difficult on long trips. Whether you travel by car or you take a bus/plane to your destination, kids need constant entertainment. I must admit that when I’m traveling by bus, my biggest fear is that there will be some irritating kids along for the ride. Kids need entertainment. Otherwise, they become irritated, they start crying, yelling, and roaming around. So, in order for you to travel safely and stress-free, I want to share some entertainment ideas. 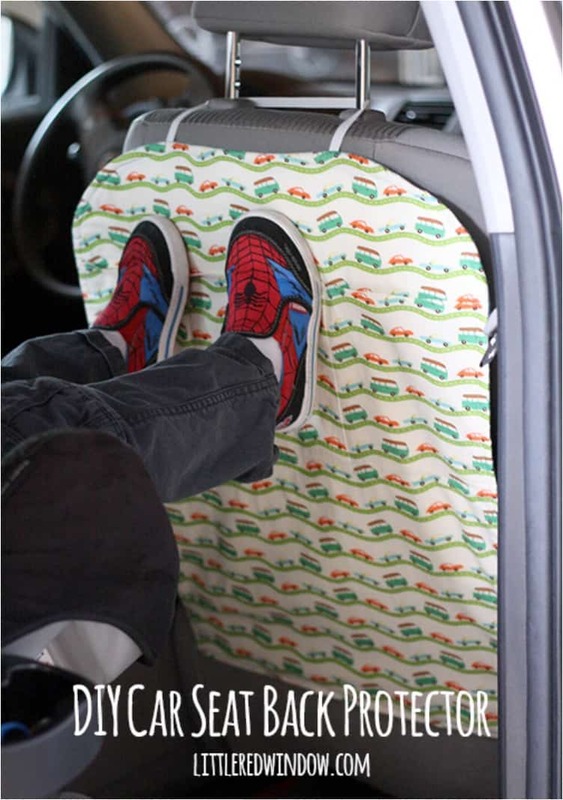 Using these ideas will keep your car clean, your kids happy and entertained, and you calm and happy while driving. Let’s start with something simple—and necessary, to be fair. During the trip, kids can get messy. They want to eat and drink in the car. And they might spill something, which leads to the need for a backseat protector. 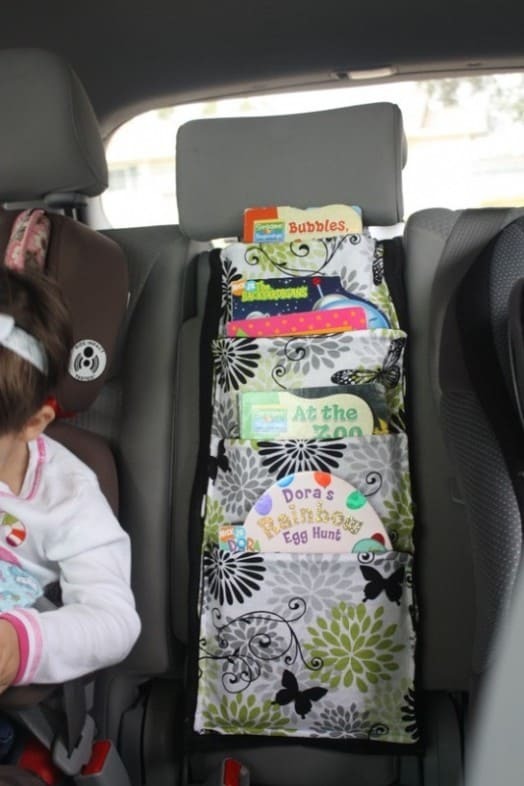 The travel organizer is placed in the middle so they have easy access to their toys and the other necessities they need during the trip. 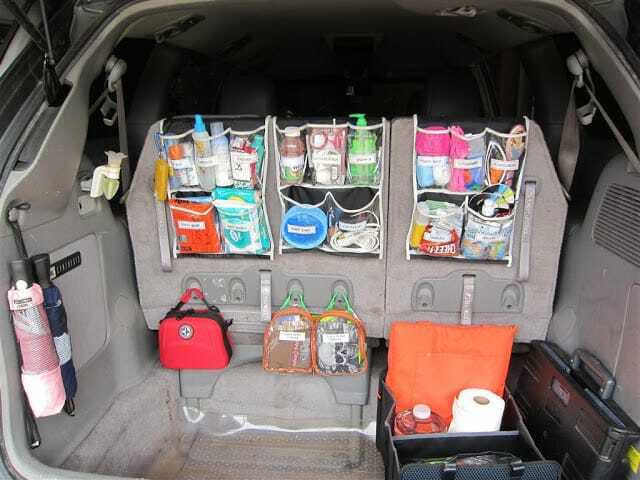 Now, you might wonder why you should organize your trunk. Well, there will surely be some pit stops along the way. And when you stop for a brief moment, you want your trunk organized so that you can find what you need in a second. All you need for this project is one basket. And then place all the toys, felt tip pens, pencils, and everything else inside. The trick, however, is to organize them. You don’t want all the kids’ necessities to be chaotically thrown in the basket. The more organized they are, the more organized your kid will leave them. You need to educate your child on how to keep the basket clean and neat, though. I said at the beginning that kids love to eat during the ride. And the worst part is they get hungry almost every hour or so. I’m sure you don’t want to stop every hour for a quick snack. To be fair, you might not even get that chance if there is no parking around. 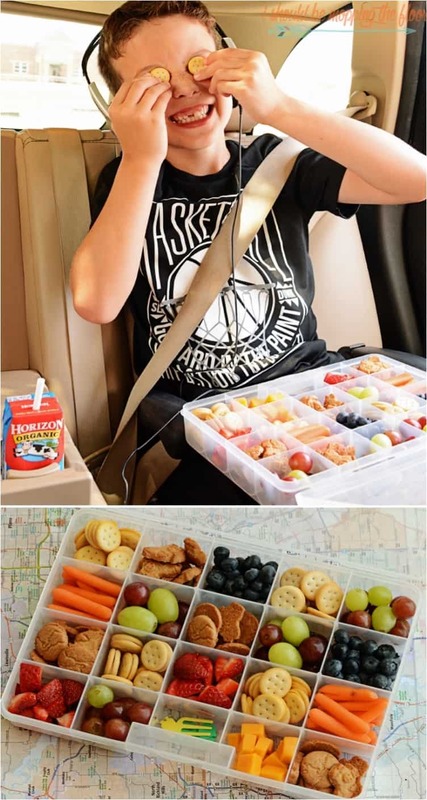 So, organize your kids’ snacks. 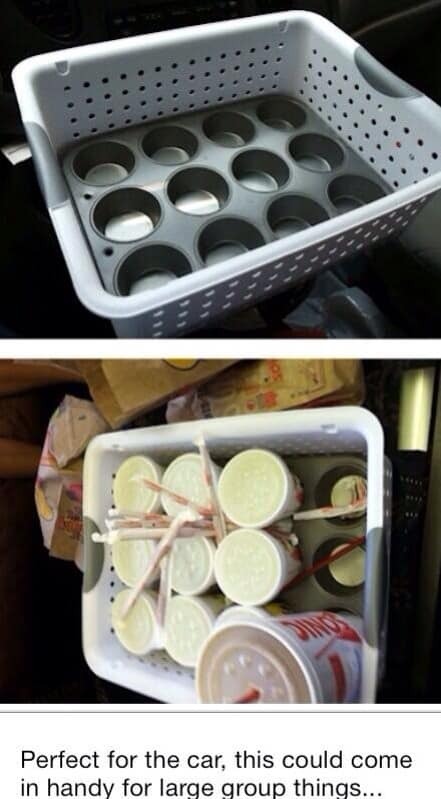 You can even go a step further and organize them in rows, by breakfast, snack, lunch, dessert, dinner. The person who invented these holders should get a Nobel Peace Prize. I’m serious. There is nothing harder than keeping the peace among kids. 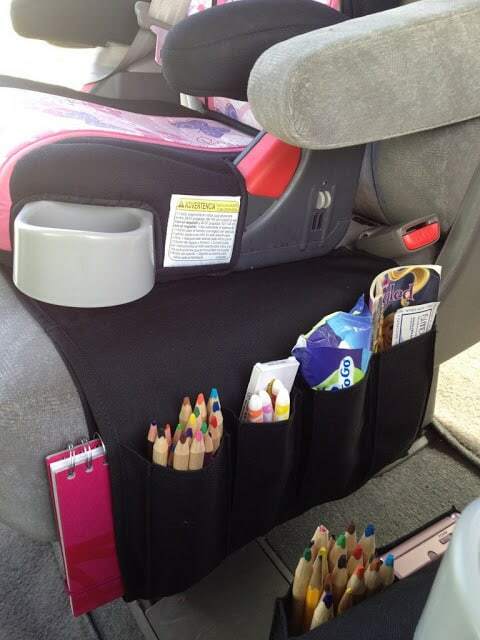 With these holders, your kids will have their toys, pens, pencils, and everything else within arm’s reach. And they won’t bug you to give them the toys. One thing you have to remember is that everything can be turned into a kid’s toy. You really have to think outside the box. Or in this case, inside the box for a way to organize your kids necessities. I mentioned at the beginning that if you don’t keep your kids entertained, they will start to move around. One thing kids love to do is place their feet on the back of your seat. Now, that’s wrong on so many levels. For starters, they can kick you in the back. And they will most definitely dirty your seat. So keep it healthy and give yourself with some support in case your kids start moving their feet. We had a food organizer before. Now we need an organizer for beverages too. 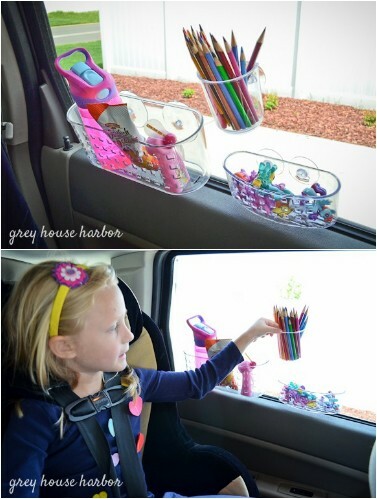 This solution will make sure your kids don’t spill their drinks while you’re driving. And let’s be honest—you want a drink or two along the way as well. If your kids love watching cartoons, you can basically keep them calm and quiet for the entire ride. All you need is a tablet loaded with cartoons. Modern cars have a tablet installed in the back of the seat. But if you have an older vehicle, you can create the same display on your own. Just make sure to load the tablet with enough cartoons for the entire ride! I want to give parents of children of all ages something for the ride. As they get older, some kids want to bring books with them. Now, most of these books are just drawing books. But in any case, you want them organized. If you have two kids, you can use the middle as a place to put all the books. A pouch is definitely something you want with you. 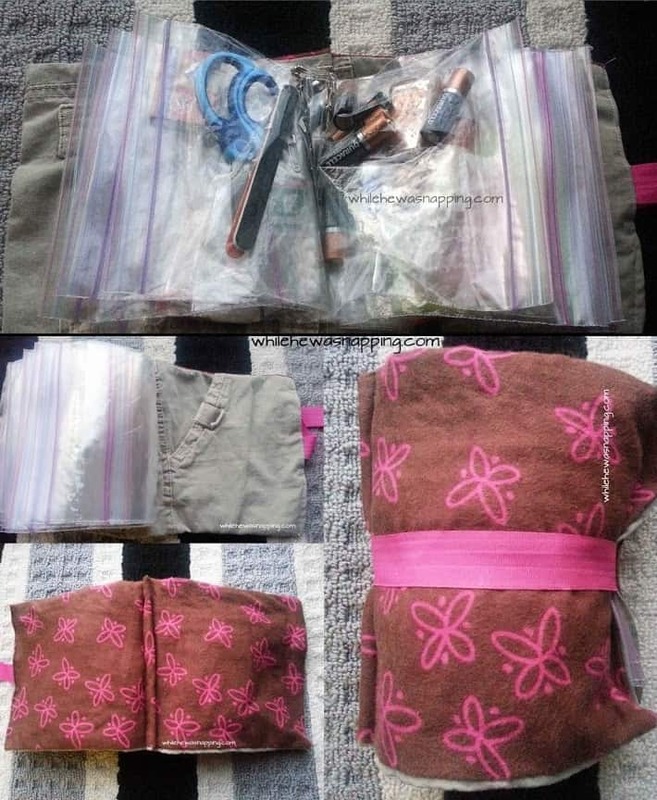 This tiny bag can be a lifesaver on a long trip. Load it with everything your kids need! If you really want to take things to the next level, I present you this state of the art entertainment center. You have a place for everything here: your phone, drinks, food, tissues, and everything in between. You can drive peacefully knowing that your kids are taken care of. 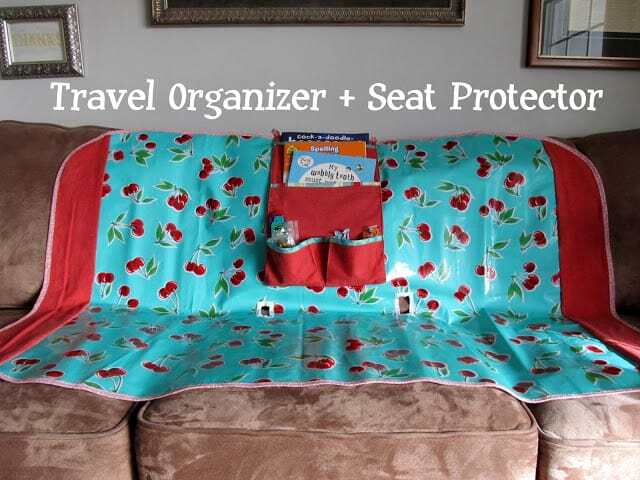 And if you are not ready to make an entire entertainment center at the back of the seat, just install a pocket. 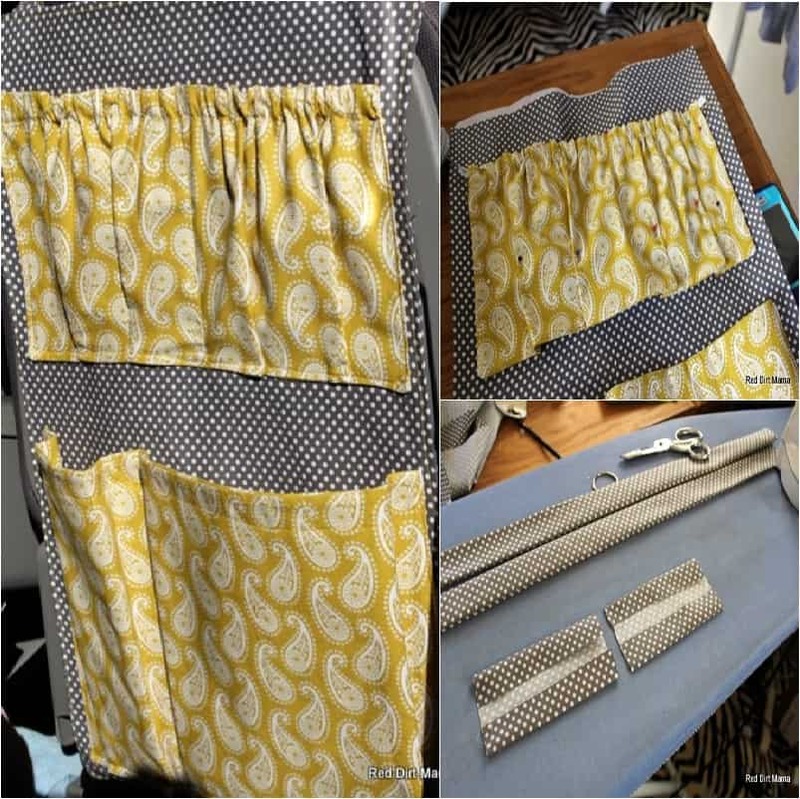 These pockets will serve as storage units for your kids’ necessities. They might not be as organized as the entertainment center, but they get the job done. After all, you need storage for all the toys and pens. 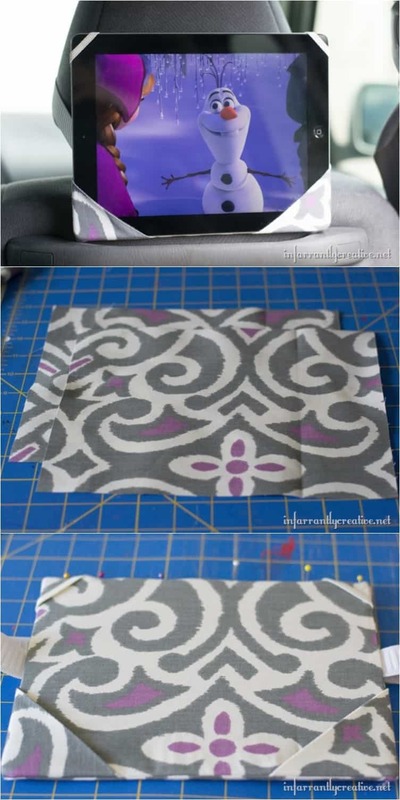 Another storage solution for the back of the seat, although this one is a bit fancier. Bags are good for one simple reason: your kids already carry a bag to school or kindergarten, and they are familiar with its purpose. A bonus point! Sometimes you don’t need a fancy way to store all the necessities. You just need a bag big enough to hold everything you need. 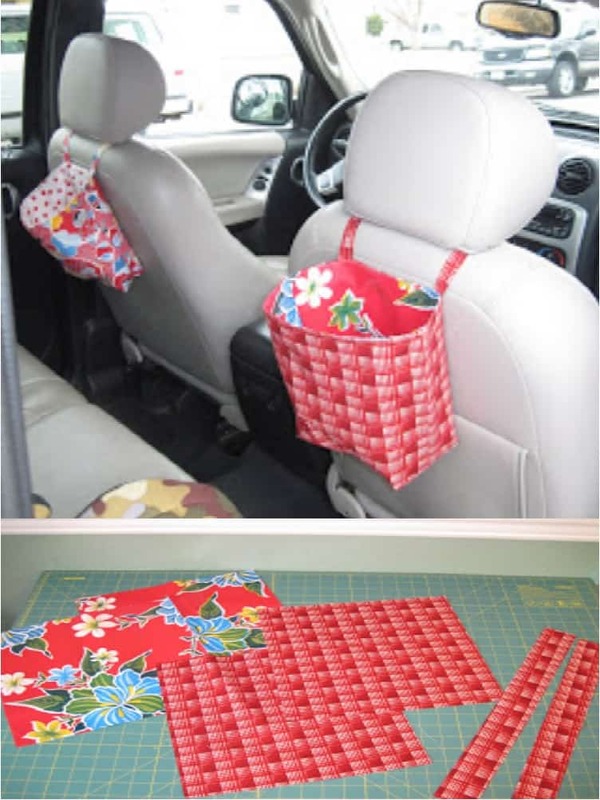 Just place the bag between the two seats, and your kids can easily reach it and get everything they need. 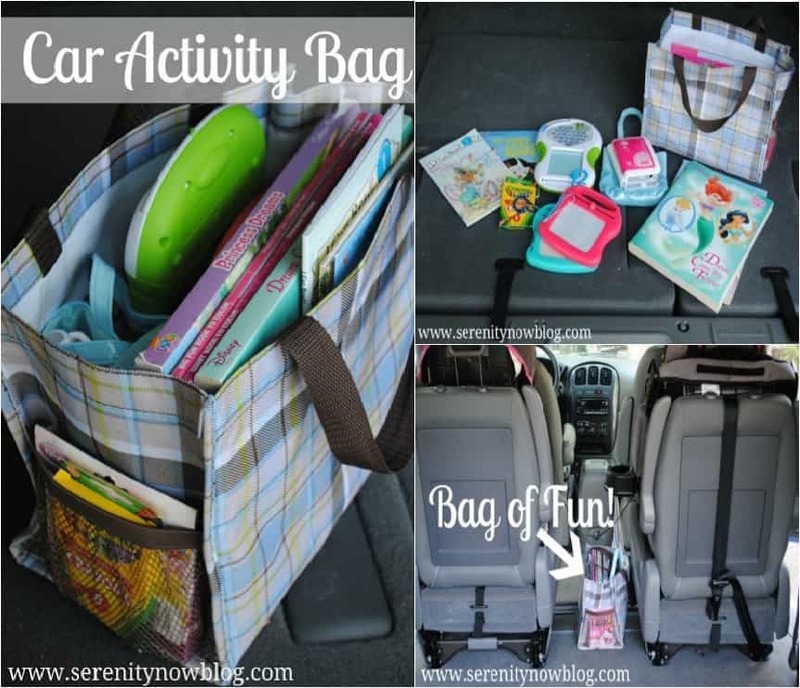 I’ve already discussed creating a snack organizer for your car. But sometimes, kids want something from McDonald’s or some other fast food restaurant. You can find some of them on the road and, as you know, they have takeaway menus. But eating fast food in the car can get messy. This is your way to prevent that. Let’s finish this with a highly organized idea. 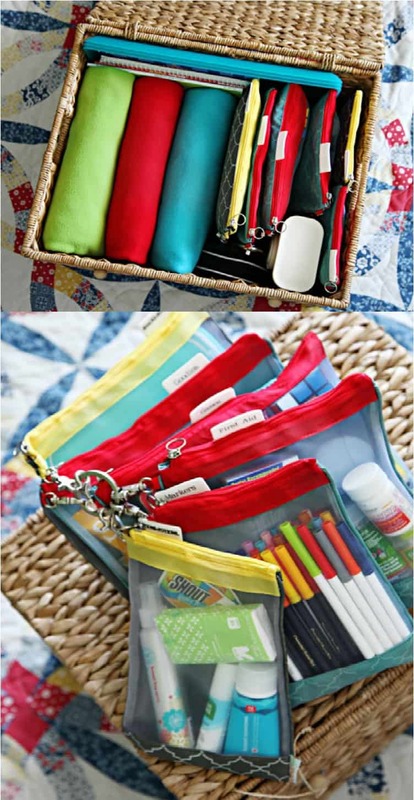 Dividing the toys, pens, and everything else into separate bags is a great way to organize your kids’ necessities. Just make sure to tell them to put everything back in place once they’re done playing with it. In conclusion, I’m sure you’ll have a peaceful trip if you follow at least one of these tips.